Bleach is a traditional cleaner, a favorite in many households, but bleach can leave a lingering smell on your hands. 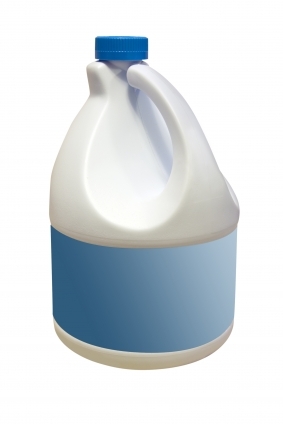 It is economical and effective at removing mold, mild, viruses and stains, so many homes and businesses rely on bleach for cleaning and laundry needs. If you don't wear gloves, or your gloves tear when using bleach, you may smell bleach on your hands long after you finish the chores. Fortunately, there are economical and effective ways to remove the smell of bleach on your hands. Remove your cleaning clothes. The residual smell left on your hands may also be on your clothes, particularly the cuffs of your shirtsleeves. The wet cuffs could keep the smell of bleach on your hands, even after using removal methods to get the odor off your hands. Wash your hands with regular soap and water. Dry your hands. See if the smell of bleach remains on your hands. Heat a liter of hot water over the stove if you still smell bleach on your hands. Bring the water to a boil and remove the pot from the stove. Hold your hands over the pot and allow the steam vapors to saturate your hands. Place your palms face down over the pot and turn your hands over, palms up, to steam both sides of your hands. The steam vapors work to remove the smell of bleach off your hands, while also removing the bleached, white spots that develop on your skin when working with different types of bleach, particularly hair bleach and abrasive cleaners. Step outside your cleaning area for a breath of fresh air to clear your sinuses. Bleach gives off gases and odorants, so the molecules from the odorants may rest on the hairs inside of your nostrils, giving you a perception that your hands still smell like bleach. Apply vapor rub inside or under your nostrils using a cotton swab to remedy the perception that bleach remains on your hands. Bleach gases may remain on your clothes or in the area that you used the bleach. Until the gasses clear the area, your olfactory senses may still perceive the smell of bleach on your hands. You can also squeeze the juice of one lemon on your hands and rinse your hands with cool water after a minute. This method may only reduce the smell for a few minutes if you were working with a concentrated solution, but works well when using diluted or lower concentrations of bleach. Talk to your doctor before using vapor rub, especially if you see a doctor for a respiratory condition. Do not use the steam vapors from the pot as the water heats on the stove. Keep you hands at a distance from the steam; close enough to get the benefit of the steam, but far enough away that you don't burn your hands. Always use gloves and mask when working with bleach and other cleaning products such as ammonia. Never mix cleaning products, especially bleach and ammonia, as the fumes could be fatal. Sensory processing and perception of smell.